Oh how fun it is to pull out these old sets! 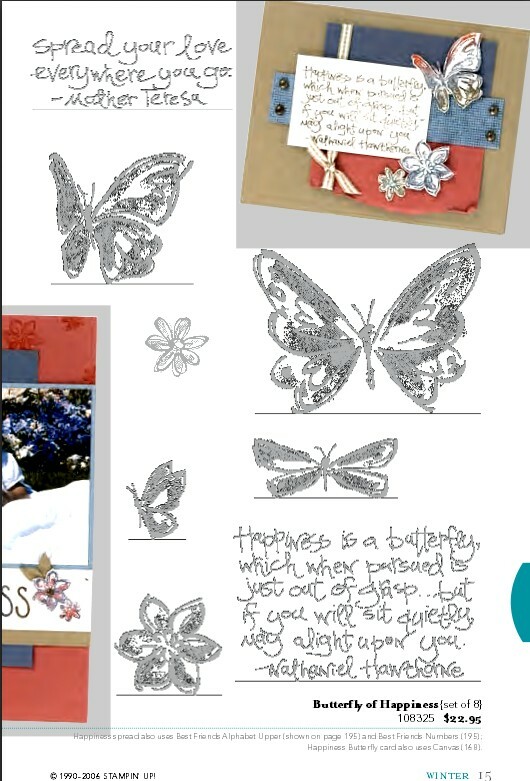 When I went digging today I found this set from the 2006 winter mini catalog--Butterfly of Happiness--you KNOW I love butterflies so I had to use it. I combined it with my sketch challenge for this week and believe it or not the Dynamic Duos Pumpkin Pie and Bashful Blue colors aging! Kept it nice and simple. I love the sentiment--don't you? Here is a picture of the full stamp set.. I would love to have you play along with this week's sketch challenge -- you have until midnight EST on Sunday night.! Click HERE for details. Why no check out what Nicole did for the challenge this week--remember that is who thought of this great Flashback Friday challenge to begin with--I just hopped on it with her! 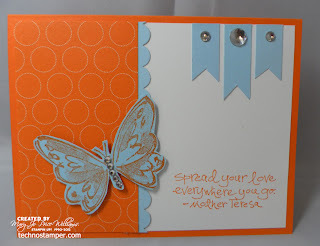 Gorgeous card Mary Jo!! SO glad you are flashing back with me on Fridays!